Anatolian Shepherd Dogs - The Anatolian Shepherd Dog is a breed of dog from Anatolia in Central Turkey and bred for guarding flocks of sheep from wolves, bears, and jackals. The Anatolian was developed to be independent and forceful, responsible on its own for guarding its master's flocks. These traits make it more challenging as a pet; owners of dogs of this breed must determinedly socialize the dogs to turn them into appropriate companions. This information is licensed under the GNU Free Documentation License. It uses material from the Anatolian Shepherd Dog article on Wikipedia.org. 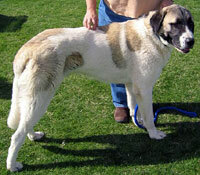 Anatolian Shepherd Dog Breeders - Advertise your kennel puppies and dogs here.